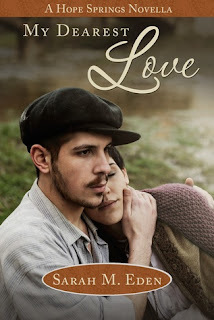 About the book: From the USA Today Bestselling author of the Longing for Home series, MY DEAREST LOVE is a new romance novella set in the beloved world of Hope Springs. My review: I kind of LOVE the Hope Springs world! I loved this one because you get to see Ian and Biddy's love story and it was just so great! But you also get to see just how the O'Connor family lived before they moved to Hope Springs and it wasn't overly pretty. The Irish living in New York were not thought well of. There were a bunch of them and they had the worst jobs with the worst working and living conditions. It was no different for the O'Connors or for Biddy either. It was probably actually worse for Biddy because there was no one to take care of her. A single woman on her own, she had to feed herself, clothe herself and provide a place to live for herself. I was really sad with the way she was treated where she worked, but that's just how it would have been. I did like the way that Ian would try to watch out for Biddy at work. I liked that he was able to bring her into his family when she needed help and the whole family cared for her, just like her own would have. This is a perfect prequel, I loved everything about it, except for I would have loved for it to be longer!